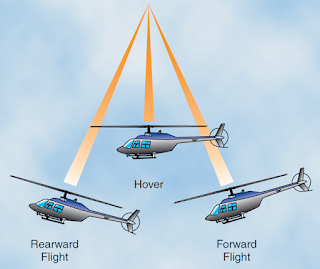 Once a helicopter leaves the ground, it is acted upon by the four aerodynamic forces. 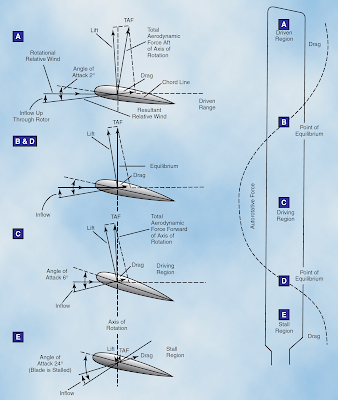 In this article, we will examine these forces as they relate to flight maneuvers. 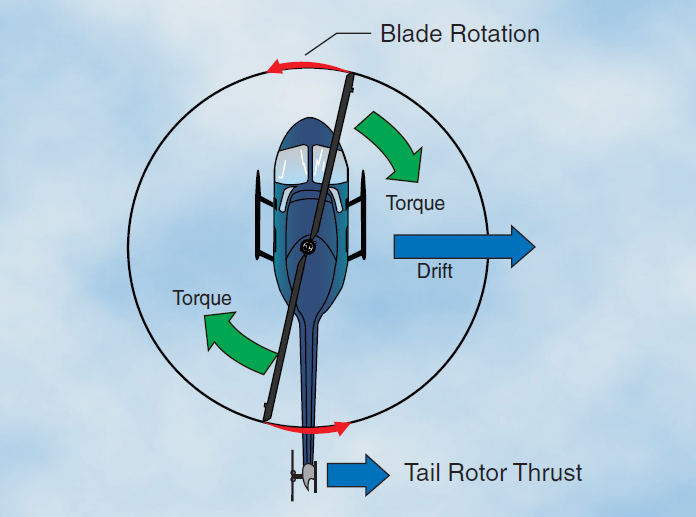 In powered flight (hovering, vertical, forward, sideward, or rearward), the total lift and thrust forces of a rotor are perpendicular to the tip-path plane or plane of rotation of the rotor. 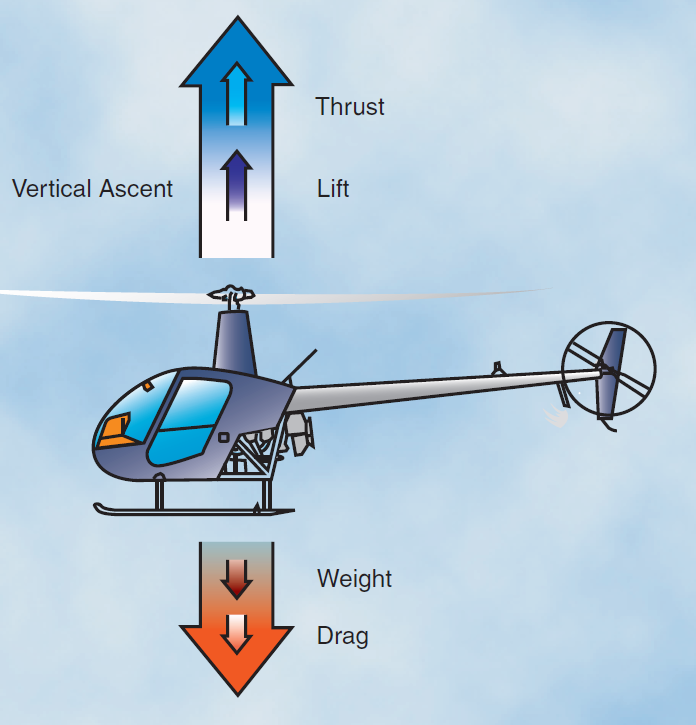 To maintain a hover at a constant altitude, enough lift and thrust must be generated to equal the weight of the helicopter and the drag produced by the rotor blades. The weight that must be supported is the total weight of the helicopter and its occupants. If the amount of thrust is greater than the actual weight, the helicopter gains altitude; if thrust is less than weight, the helicopter loses altitude. The drag of a hovering helicopter is mainly induced drag incurred while the blades are producing lift. There is, however, some profile drag on the blades as they rotate through the air. Throughout the rest of this discussion, the term “drag” includes both induced and profile drag. An important consequence of producing thrust is torque. As stated before, for every action there is an equal and opposite reaction. Therefore, as the engine turns the main rotor system in a counterclockwise direction, the helicopter fuselage turns clockwise. 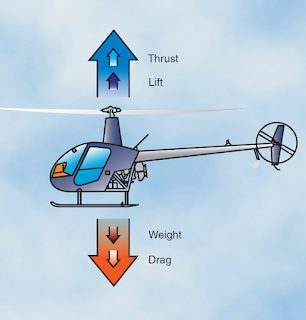 The amount of torque is directly related to the amount of engine power being used to turn the main rotor system. Remember, as power changes, torque changes. A tail rotor is designed to produce thrust in a direction opposite torque. The thrust produced by the tail rotor is sufficient to move the helicopter laterally. The main transmission is mounted so that the rotor mast is rigged for the tip-path plane to have a builtin tilt opposite tail thrust, thus producing a small sideward thrust. Flight control rigging is designed so that the rotor disc is tilted slightly opposite tail rotor thrust when the cyclic is centered. The cyclic pitch control system is designed so that the rotor disc tilts slightly opposite tail rotor thrust when in a hover. 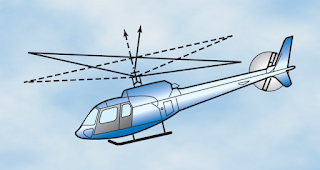 Counteracting translating tendency, in a helicopter with a counterclockwise main rotor system, causes the left skid to hang lower while hovering. 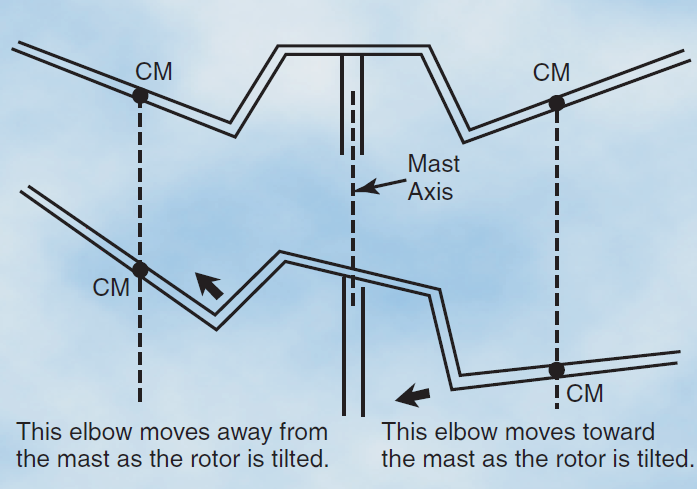 The opposite is true for rotor systems turning clockwise when viewed from above. In order for a helicopter to generate lift, the rotor blades must be turning. This creates a relative wind that is opposite the direction of rotor system rotation. The rotation of the rotor system creates centrifugal force (inertia), which tends to pull the blades straight outward from the main rotor hub. The faster the rotation, the greater the centrifugal force. This force gives the rotor blades their rigidity and, in turn, the strength to support the weight of the helicopter. The centrifugal force generated determines the maximum operating rotor r.p.m. due to structural limitations on the main rotor system. Coriolis Effect, which is sometimes referred to as conservation of angular momentum, might be compared to spinning skaters. When they extend their arms, their rotation slows down because the center of mass moves farther from the axis of rotation. When their arms are retracted, the rotation speeds up because the center of mass moves closer to the axis of rotation. When a rotor blade flaps upward, the center of mass of that blade moves closer to the axis of rotation and blade acceleration takes place in order to conserve angular momentum. Conversely, when that blade flaps downward, its center of mass moves further from the axis of rotation and blade deceleration takes place. 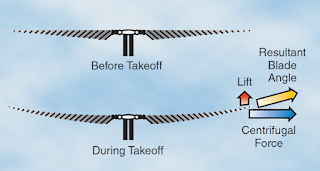 [Figure 5] Keep in mind that due to coning, a rotor blade will not flap below a plane passing through the rotor hub and perpendicular to the axis of rotation. The acceleration and deceleration actions of the rotor blades are absorbed by either dampers or the blade structure itself, depending upon the design of the rotor system. Two-bladed rotor systems are normally subject to Coriolis Effect to a much lesser degree than are articulated rotor systems since the blades are generally “underslung” with respect to the rotor hub, and the change in the distance of the center of mass from the axis of rotation is small. [Figure 6] The hunting action is absorbed by the blades through bending. If a two-bladed rotor system is not “underslung,” it will be subject to Coriolis Effect comparable to that of a fully articulated system. When hovering near the ground, a phenomenon known as ground effect takes place. 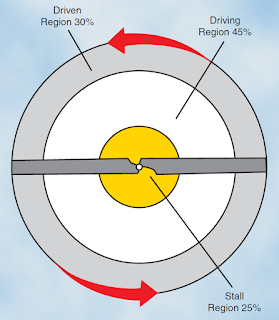 [Figure 7] This effect usually occurs less than one rotor diameter above the surface. As the induced airflow through the rotor disc is reduced by the surface friction, the lift vector increases. This allows a lower rotor blade angle for the same amount of lift, which reduces induced drag. Ground effect also restricts the generation of blade tip vortices due to the downward and outward airflow making a larger portion of the blade produce lift. 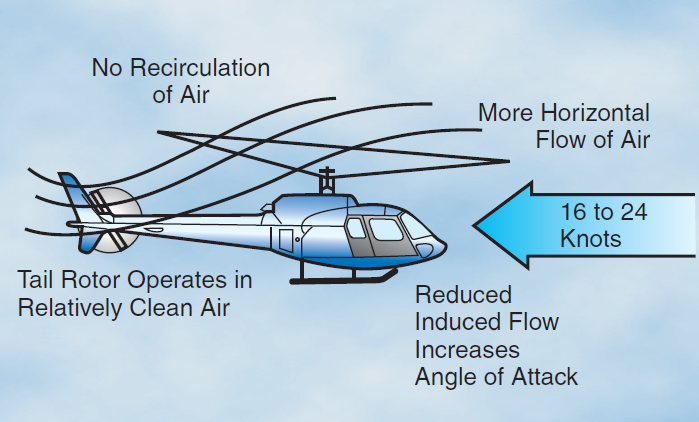 When the helicopter gains altitude vertically, with no forward airspeed, induced airflow is no longer restricted, and the blade tip vortices increase with the decrease in outward airflow. 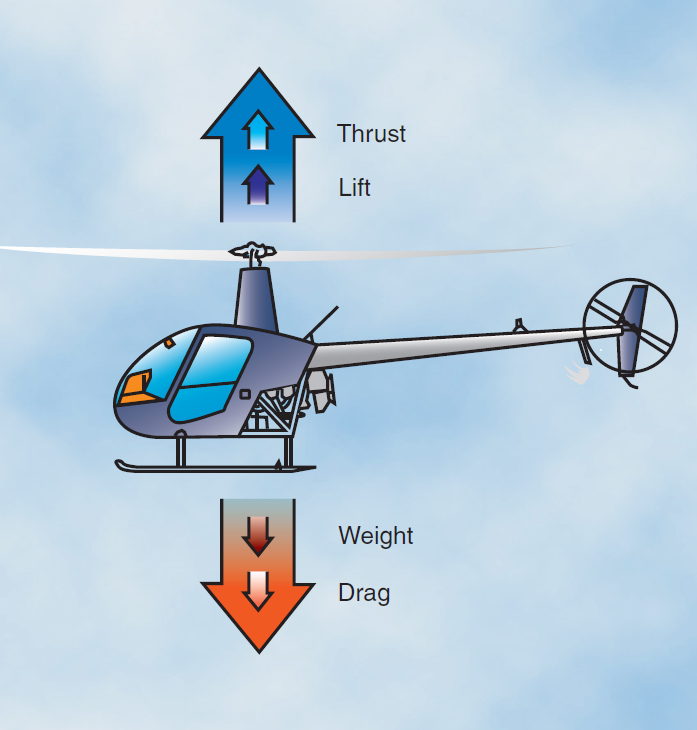 As a result, drag increases which means a higher pitch angle, and more power is needed to move the air down through the rotor. Ground effect is at its maximum in a no-wind condition over a firm, smooth surface. Tall grass, rough terrain, revetments, and water surfaces alter the airflow pattern, causing an increase in rotor tip vortices. Let us look at a two-bladed rotor system to see how gyroscopic precession affects the movement of the tippath plane. 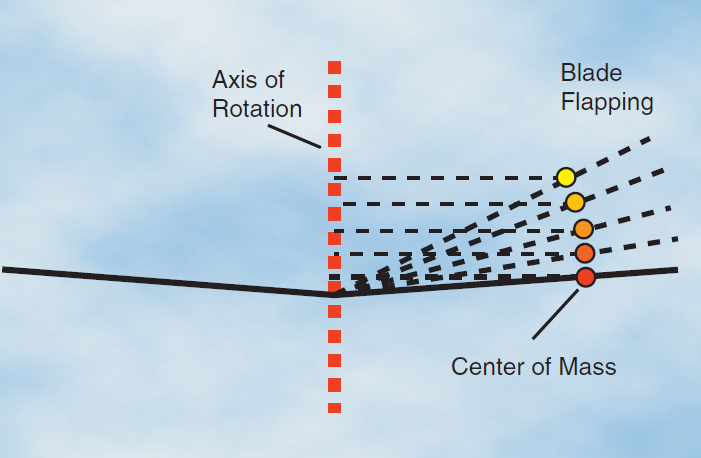 Moving the cyclic pitch control increases the angle of attack of one rotor blade with the result that a greater lifting force is applied at that point in the plane of rotation. This same control movement simultaneously decreases the angle of attack of the other blade the same amount, thus decreasing the lifting force applied at that point in the plane of rotation. The blade with the increased angle of attack tends to flap up; the blade with the decreased angle of attack tends to flap down. Because the rotor disk acts like a gyro, the blades reach maximum deflection at a point approximately 90° later in the plane of rotation. 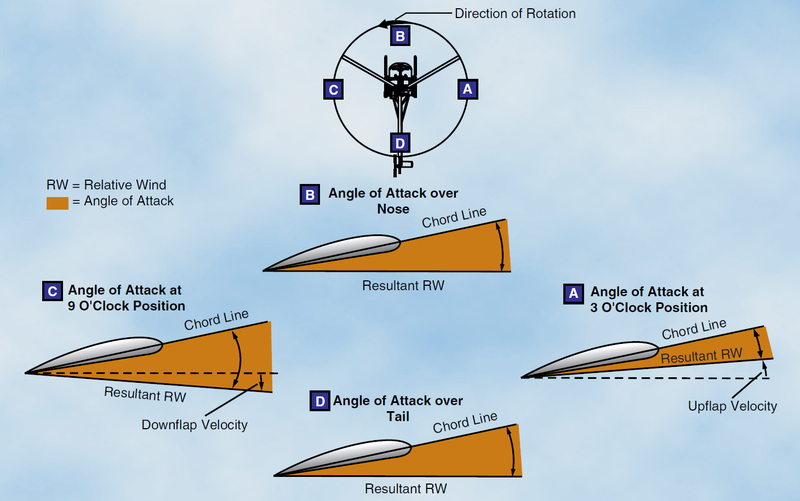 As shown in figure 9, the retreating blade angle of attack is increased and the advancing blade angle of attack is decreased resulting in a tipping forward of the tip-path plane, since maximum deflection takes place 90° later when the blades are at the rear and front, respectively. In a rotor system using three or more blades, the movement of the cyclic pitch control changes the angle of attack of each blade an appropriate amount so that the end result is the same. 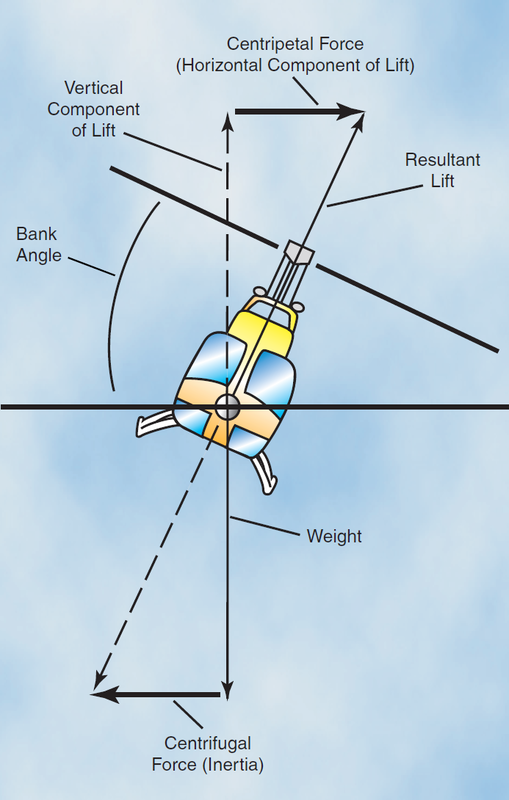 In straight-and-level, unaccelerated forward flight, lift equals weight and thrust equals drag (straight-and-level flight is flight with a constant heading and at a constant altitude). 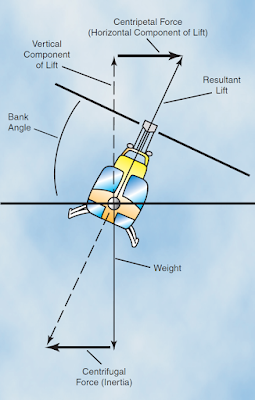 If lift exceeds weight, the helicopter climbs; if lift is less than weight, the helicopter descends. 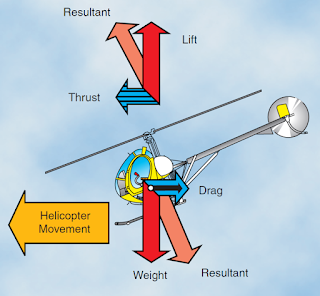 If thrust exceeds drag, the helicopter speeds up; if thrust is less than drag, it slows down. As the helicopter moves forward, it begins to lose altitude because of the lift that is lost as thrust is diverted forward. 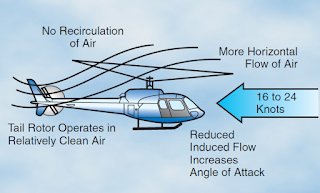 However, as the helicopter begins to accelerate, the rotor system becomes more efficient due to the increased airflow. The result is excess power over that which is required to hover. Continued acceleration causes an even larger increase in airflow through the rotor disc and more excess power. 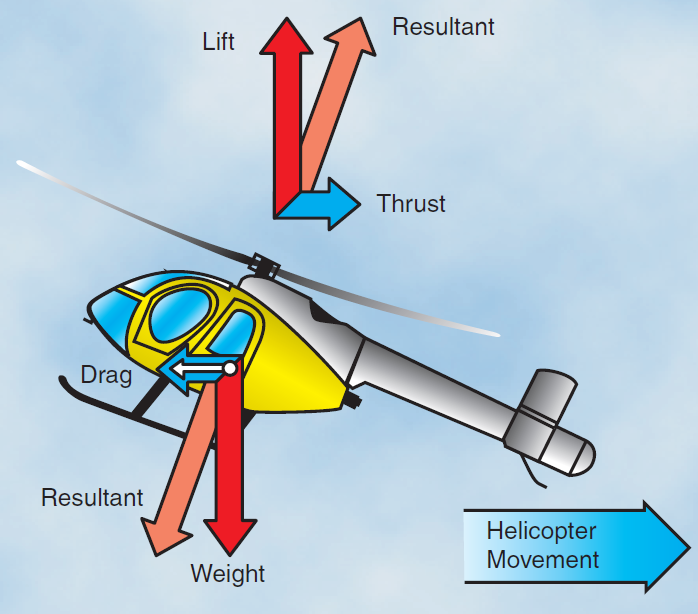 When a single-rotor helicopter flies through translational lift, the air flowing through the main rotor and over the tail rotor becomes less turbulent and more aerodynamically efficient. As the tail rotor efficiency improves, more thrust is produced causing the aircraft to yaw left in a counterclockwise rotor system. It will be necessary to use right torque pedal to correct for this tendency on takeoff. Also, if no corrections are made, the nose rises or pitches up, and rolls to the right. This is caused by combined effects of dissymmetry of lift and transverse flow effect, and is corrected with cyclic control. Translational lift is also present in a stationary hover if the wind speed is approximately 16 to 24 knots. In normal operations, always utilize the benefit of translational lift, especially if maximum performance is needed. 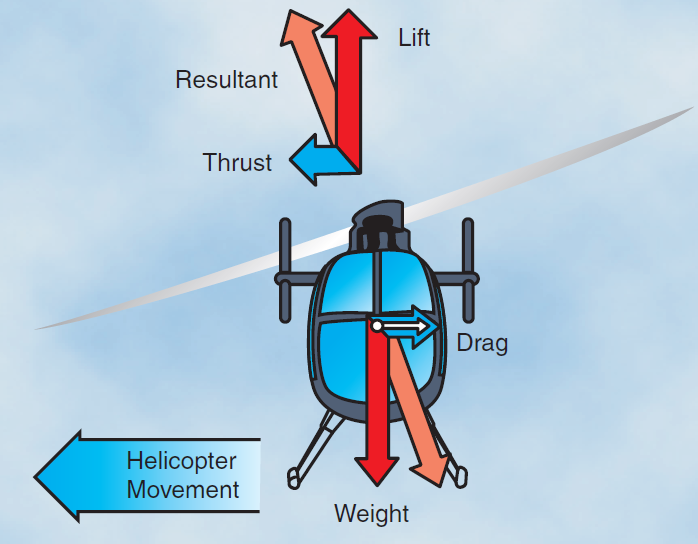 As the helicopter accelerates in forward flight, induced flow drops to near zero at the forward disc area and increases at the aft disc area. This increases the angle of attack at the front disc area causing the rotor blade to flap up, and reduces angle of attack at the aft disc area causing the rotor blade to flap down. Because the rotor acts like a gyro, maximum displacement occurs 90° in the direction of rotation. 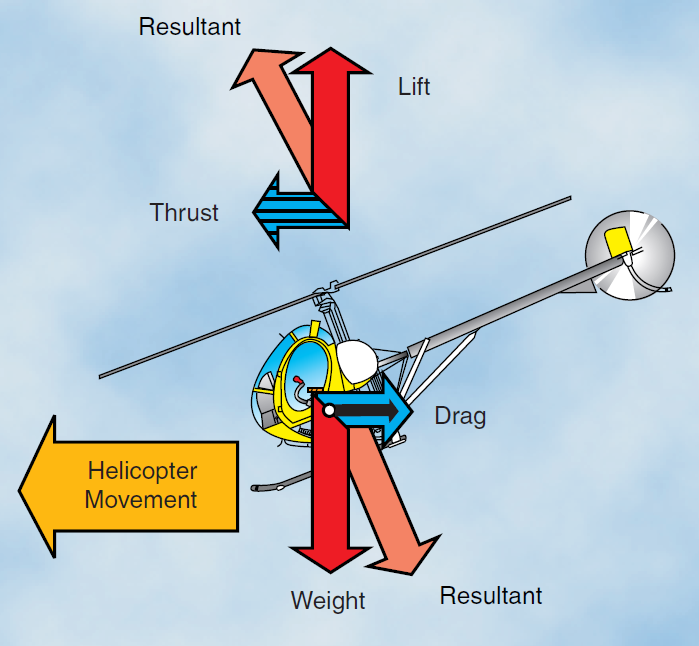 The result is a tendency for the helicopter to roll slightly to the right as it accelerates through approximately 20 knots or if the headwind is approximately 20 knots. 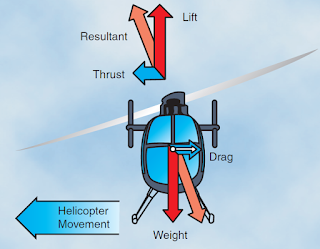 You can recognize transverse flow effect because of increased vibrations of the helicopter at airspeeds just below effective translational lift on takeoff and after passing through effective translational lift during landing. To counteract transverse flow effect, a cyclic input needs to be made. The blade tip speed of this helicopter is approximately 300 knots. If the helicopter is moving forward at 100 knots, the relative wind speed on the advancing side is 400 knots. On the retreating side, it is only 200 knots. This difference in speed causes a dissymmetry of lift. 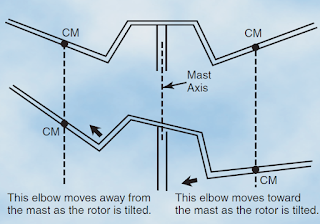 If this condition was allowed to exist, a helicopter with a counterclockwise main rotor blade rotation would roll to the left because of the difference in lift. In reality, the main rotor blades flap and feather automatically to equalize lift across the rotor disc. Articulated rotor systems, usually with three or more blades, incorporate a horizontal hinge (flapping hinge) to allow the individual rotor blades to move, or flap up and down as they rotate. A semirigid rotor system (two blades) utilizes a teetering hinge, which allows the blades to flap as a unit. When one blade flaps up, the other flaps down. As shown in figure 15, as the rotor blade reaches the advancing side of the rotor disc (A), it reaches its maximum upflap velocity. When the blade flaps upward, the angle between the chord line and the resultant relative wind decreases. This decreases the angle of attack, which reduces the amount of lift produced by the blade. At position (C) the rotor blade is now at its maximum downflapping velocity. Due to downflapping, the angle between the chord line and the resultant relative wind increases. This increases the angle of attack and thus the amount of lift produced by the blade. 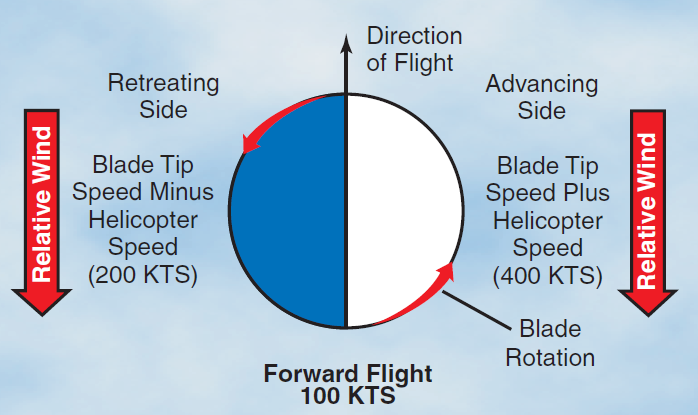 The combination of blade flapping and slow relative wind acting on the retreating blade normally limits the maximum forward speed of a helicopter. 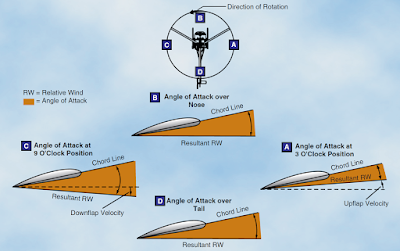 At a high forward speed, the retreating blade stalls because of a high angle of attack and slow relative wind speed. This situation is called retreating blade stall and is evidenced by a nose pitch up, vibration, and a rolling tendency—usually to the left in helicopters with counterclockwise blade rotation. You can avoid retreating blade stall by not exceeding the never-exceed speed. This speed is designated VNE and is usually indicated on a placard and marked on the airspeed indicator by a red line. During aerodynamic flapping of the rotor blades as they compensate for dissymmetry of lift, the advancing blade achieves maximum upflapping displacement over the nose and maximum downflapping displacement over the tail. This causes the tip-path plane to tilt to the rear and is referred to as blowback. 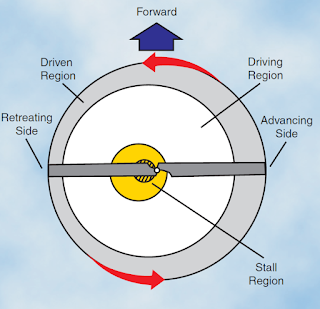 Figure 16 shows how the rotor disc was originally oriented with the front down following the initial cyclic input, but as airspeed is gained and flapping eliminates dissymmetry of lift, the front of the disc comes up, and the back of the disc goes down. This reorientation of the rotor disc changes the direction in which total rotor thrust acts so that the helicopter’s forward speed slows, but can be corrected with cyclic input. Figure 16. To compensate for blowback, you must move the cyclic forward. Blowback is more pronounced with higher airspeeds. As the angle of bank increases, the total lift force is tilted more toward the horizontal, thus causing the rate of turn to increase because more lift is acting horizontally. Since the resultant lifting force acts more horizontally, the effect of lift acting vertically is deceased. To compensate for this decreased vertical lift, the angle of attack of the rotor blades must be increased in order to maintain altitude. The steeper the angle of bank, the greater the angle of attack of the rotor blades required to maintain altitude. Thus, with an increase in bank and a greater angle of attack, the resultant lifting force increases and the rate of turn is faster. Most autorotations are performed with forward speed. For simplicity, the following aerodynamic explanation is based on a vertical autorotative descent (no forward speed) in still air. 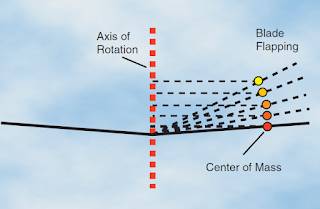 Under these conditions, the forces that cause the blades to turn are similar for all blades regardless of their position in the plane of rotation. 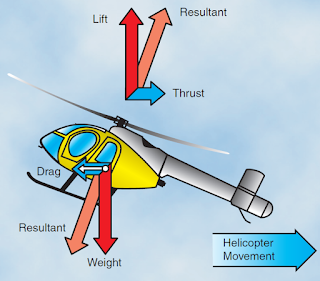 Therefore, dissymmetry of lift resulting from helicopter airspeed is not a factor. 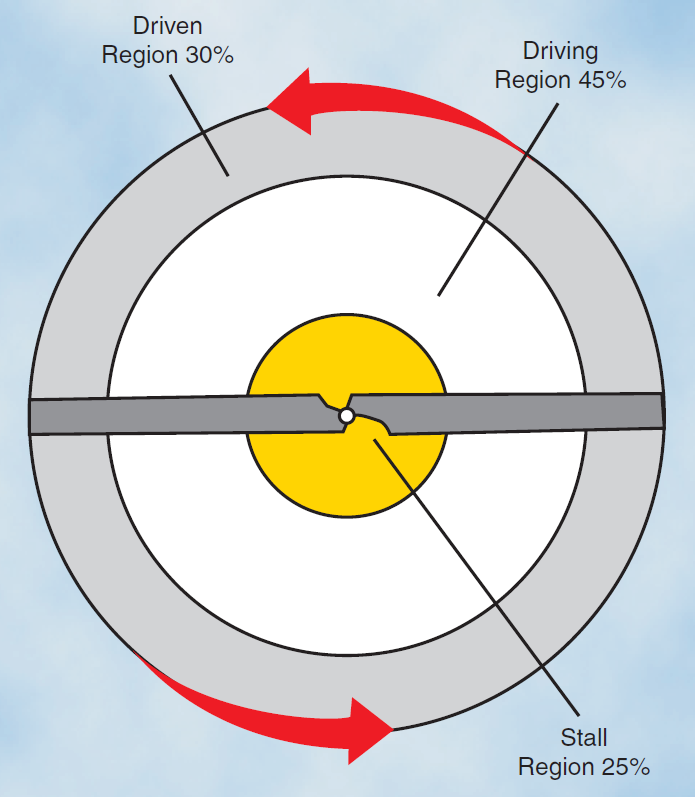 During vertical autorotation, the rotor disc is divided into three regions as illustrated in figure 21—the driven region, the driving region, and the stall region. 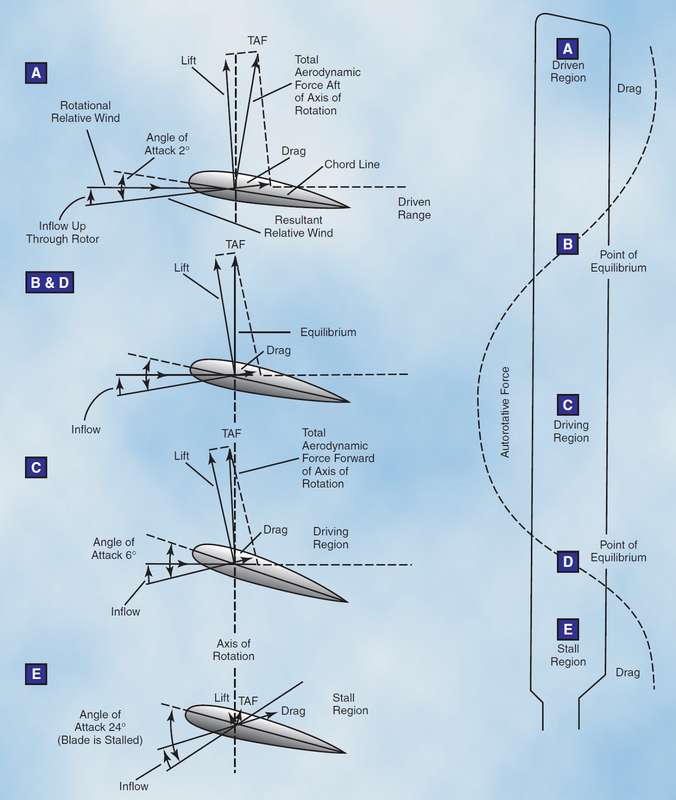 Figure 22 shows four blade sections that illustrate force vectors. Part A is the driven region, B and D are points of equilibrium, part C is the driving region, and part E is the stall region. Force vectors are different in each region because rotational relative wind is slower near the blade root and increases continually toward the blade tip. Also, blade twist gives a more positive angle of attack in the driving region than in the driven region. The combination of the inflow up through the rotor with rotational relative wind produces different combinations of aerodynamic force at every point along the blade. The driven region, also called the propeller region, is nearest the blade tips. Normally, it consists of about 30 percent of the radius. In the driven region, part Aof figure 22, the total aerodynamic force acts behind the axis of rotation, resulting in a overall drag force. The driven region produces some lift, but that lift is offset by drag. The overall result is a deceleration in the rotation of the blade. The size of this region varies with the blade pitch, rate of descent, and rotor r.p.m. When changing autorotative r.p.m., blade pitch, or rate of descent, the size of the driven region in relation to the other regions also changes. There are two points of equilibrium on the blade—one between the driven region and the driving region, and one between the driving region and the stall region. At points of equilibrium, total aerodynamic force is aligned with the axis of rotation. Lift and drag are produced, but the total effect produces neither acceleration nor deceleration. The driving region, or autorotative region, normally lies between 25 to 70 percent of the blade radius. Part C of figure 22 shows the driving region of the blade, which produces the forces needed to turn the blades during autorotation. Total aerodynamic force in the driving region is inclined slightly forward of the axis of rotation, producing a continual acceleration force. This inclination supplies thrust, which tends to accelerate the rotation of the blade. Driving region size varies with blade pitch setting, rate of descent, and rotor r.p.m. By controlling the size of this region you can adjust autorotative r.p.m. For example, if the collective pitch is raised, the pitch angle increases in all regions. This causes the point of equilibrium to move inboard along the blade’s span, thus increasing the size of the driven region. The stall region also becomes larger while the driving region becomes smaller. Reducing the size of the driving region causes the acceleration force of the driving region and r.p.m. to decrease. The inner 25 percent of the rotor blade is referred to as the stall region and operates above its maximum angle of attack (stall angle) causing drag which tends to slow rotation of the blade. Part E of figure 22 depicts the stall region. Aconstant rotor r.p.m. is achieved by adjusting the collective pitch so blade acceleration forces from the driving region are balanced with the deceleration forces from the driven and stall regions. 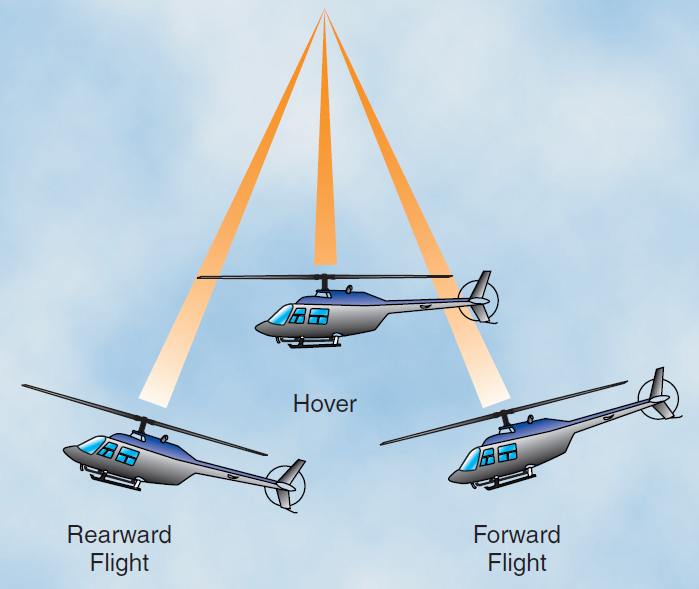 Autorotative force in forward flight is produced in exactly the same manner as when the helicopter is descending vertically in still air. 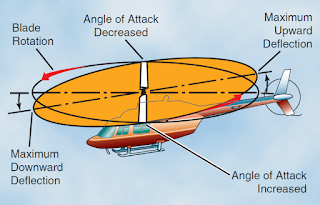 However, because forward speed changes the inflow of air up through the rotor disc, all three regions move outboard along the blade span on the retreating side of the disc where angle of attack is larger, as shown in figure 23. With lower angles of attack on the advancing side blade, more of that blade falls in the driven region. On the retreating side, more of the blade is in the stall region. A small section near the root experiences a reversed flow, therefore the size of the driven region on the retreating side is reduced.